The Interface is very simple but provides enough core features to be effective. Not as powerful as Google AdWords though. Easy to use interface that is very powerful. Google™ also provides a desktop application to manage the AdWords account. Immense feature set that to the rookie may be over whelming at first. Delayed by 24 hours to process and update. Real-time performance displayed in dashboard. No, there is no possibility to trigger ad placement through keywords. Yes, that’s the bread and butter of Google AdWords. Very cool feature that can give extremely targeted leads. Followed by the real hidden URL). Very similar to Google AdWords. Very similar to LinkedIn®. Allows for headline, 2 line description and then displayed URL and real URL. Base price of $10 for 1000 impressions. Targeting costs $3-$6 per segment. A maximum of 2 Targets can be purchased. It’s a keyword bidding model for Clicks (not impressions.) So the cost can be as low as a few cents for each click to as high as + $20. Pre-paid account system for each ad placement. Payment starts at $25 minimum and can be set at increments of $5. Can accept most major credit cards. But billing address should be US based. I think that’s a glitch. Also each time a new ad is created, payment is required. Can accept most major credit cards. Prepayment is required and preauthorization allows for automatic replenishment when credit is low. One payment account can pay for many ad campaigns. Suggested landing pages include downloads of whitepaper, and other marketing collateral as the hook. Suggested landing pages can be download of the software, trial/demo as well as marketing collaterals for download. Hard to say. Just started using it. But I get a feeling that the leads will be a bit like the leads I get from the Google Content Network as opposed to the Direct Search method. Very good leads. Allows for extremely targeted leads to come through and campaign can be easily managed for optimum performances. In terms of best value of money, I am still leaning towards Google Adwords because of the power of the system through keyword bidding. But since its still very early in my LinkedIn DirectAds trial, I’ll revisit this section as I learn how to leverage its feature set. 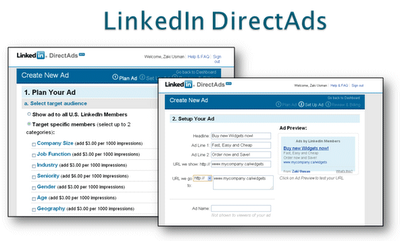 Don’t forget to read round 2 of the LinkedIn DirectAds vs Google Adwords. LinkedIn direct ads are just good for recruitment ads, you cant generate real leads out of them.